» Smart Roofing, Inc. – Natural Slate Roof installed in Oak Brook SMART Roofing Inc: Chicago Roofing Contractor, Roof Repair, Installation, Hail Damage, Hail Storm Damage Smart Roofing, Inc. – Natural Slate Roof installed in Oak Brook Roofing Contractor - SMART Roofing Inc: Roof Repair, Installation, Hail Damage, Hail Storm Damage. 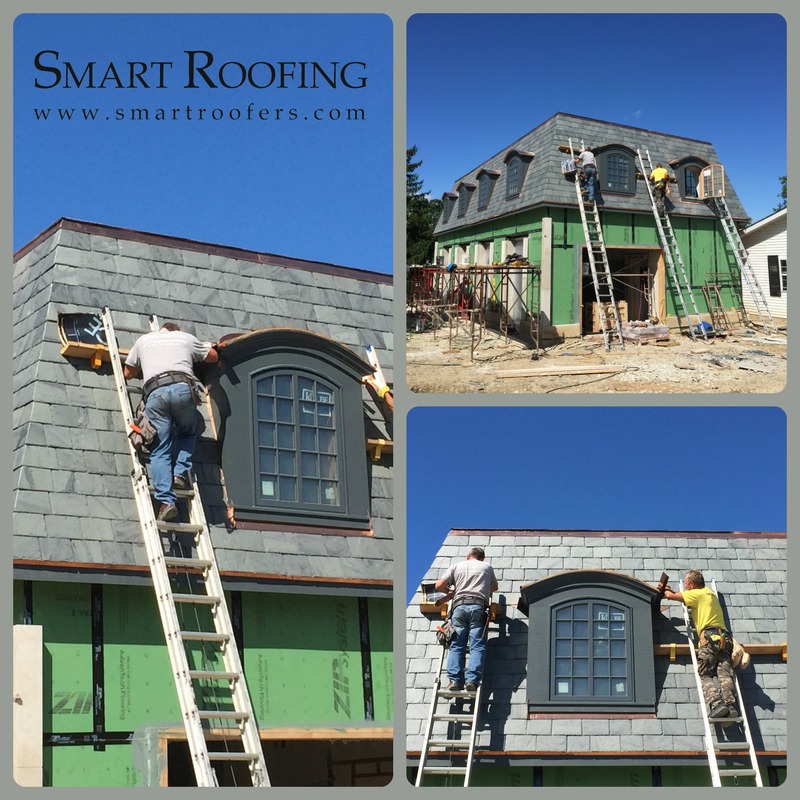 Smart Roofing, Inc. is pleased to share this natural slate roof being installed on a coach house in Oak Brook. This type of roof is known as a Mansard roof. This Mansard roof consists of Natural Slate by Evergreen Slate. Slate quarried for roofing stock is of dense, sound rock and exceedingly tough and durable. A Natural Slate Roof can last a century, giving excellent long-term value. Evergreen Slate is the largest producer and supplier of slate in the United States. Since 1916, the company has taken pride in providing its customers with high-quality products and excellent customer service, as the leader in the slate roofing industry. Smart Roofing, Inc. will also be replacing the roof on the main house of this Oak Brook property in the Spring with this beautiful Natural Slate product. Be sure to check back for those photos! 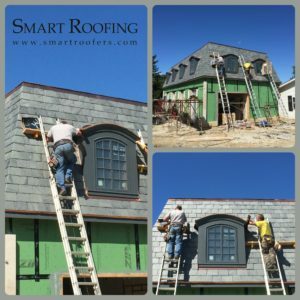 In the meantime, contact the roofing experts at Smart Roofing, Inc.at (847) 797-0404, to learn more about our roof products and services, or email us at contactus@smartroofers.com for your other residential or commercial roofing needs. This entry was posted in News, Warnings and tagged Algonquin Evergreen Slate, Algonquin Mansard roof, Algonquin natural slate, Algonquin Slate Roof, Antioch Evergreen Slate, Antioch Mansard roof, Antioch natural slate, Antioch Slate Roof, Arlington Heights Evergreen Slate, Arlington Heights Mansard roof, Arlington Heights natural slate, Arlington Heights Slate Roof, Aurora Evergreen Slate, Aurora Mansard roof, Aurora natural slate, Aurora Slate Roof, Barrington Evergreen Slate, Barrington Hills Evergreen Slate, Barrington Hills Mansard roof, Barrington Hills natural slate, Barrington Hills Slate Roof, Barrington Mansard roof, Barrington natural slate, Barrington Slate Roof, Bartlet Evergreen Slate, Bartlet Mansard roof, Bartlet natural slate, Bartlet Slate Roof, Batavia Evergreen Slate, Batavia Mansard roof, Batavia natural slate, Batavia Slate Roof, Bedford Park Evergreen Slate, Bedford Park Mansard roof, Bedford Park natural slate, Bedford Park Slate Roof, Bensenville Evergreen Slate, Bensenville Mansard roof, Bensenville natural slate, Bensenville Slate Roof, Berwyn Evergreen Slate, Berwyn Mansard roof, Berwyn natural slate, Berwyn Slate Roof, Bridgeview Evergreen Slate, Bridgeview Mansard roof, Bridgeview natural slate, Bridgeview Slate Roof, Broadview Evergreen Slate, Broadview Mansard roof, Broadview natural slate, Broadview Slate Roof, Brookfield Evergreen Slate, Brookfield Mansard roof, Brookfield natural slate, Brookfield Slate Roof, Buffalo Grove Evergreen Slate, Buffalo Grove Mansard roof, Buffalo Grove natural slate, Buffalo Grove Slate Roof, Burr Ridge Evergreen Slate, Burr Ridge Mansard roof, Burr Ridge natural slate, Burr Ridge Slate Roof, Chicago Evergreen Slate, Chicago Heights Evergreen Slate, Chicago Heights Mansard roof, Chicago Heights natural slate, Chicago Heights Slate Roof, Chicago Mansard roof, Chicago natural slate, Chicago North Shore Evergreen Slate, Chicago North Shore Mansard roof, Chicago North Shore natural slate, Chicago North Shore Slate Roof, Chicago Northwest Suburbs Evergreen Slate, Chicago Northwest Suburbs Mansard roof, Chicago Northwest Suburbs natural slate, Chicago Northwest Suburbs Slate Roof, Chicago Slate Roof, Chicago Suburbs Evergreen Slate, Chicago Suburbs Mansard roof, Chicago Suburbs natural slate, Chicago Suburbs Slate Roof, Cicero Evergreen Slate, Cicero Mansard roof, Cicero natural slate, Cicero Slate Roof, Country Club Hills Evergreen Slate, Country Club Hills Mansard roof, Country Club Hills natural slate, Country Club Hills Slate Roof, Countrysie Evergreen Slate, Countrysie Mansard roof, Countrysie natural slate, Countrysie Slate Roof, Crestwood Evergreen Slate, Crestwood Mansard roof, Crestwood natural slate, Crestwood Slate Roof, Crystal Lake Evergreen Slate, Crystal Lake Mansard roof, Crystal Lake natural slate, Crystal Lake Slate Roof, Deer Park Evergreen Slate, Deer Park Mansard roof, Deer Park natural slate, Deer Park Slate Roof, Deerfield Evergreen Slate, Deerfield Mansard roof, Deerfield natural slate, Deerfield Slate Roof, Des Plaines Evergreen Slate, Des Plaines Mansard roof, Des Plaines natural slate, Des Plaines Slate Roof, Dundee Evergreen Slate, Dundee Mansard roof, Dundee natural slate, Dundee Slate Roof, Elgin Evergreen Slate, Elgin Mansard roof, Elgin natural slate, Elgin Slate Roof, Elk Grove Village Evergreen Slate, Elk Grove Village Mansard roof, Elk Grove Village natural slate, Elk Grove Village Slate Roof, Elmhurst Evergreen Slate, Elmhurst Mansard roof, Elmhurst natural slate, Elmhurst Slate Roof, Elmwood Park Evergreen Slate, Elmwood Park Mansard roof, Elmwood Park natural slate, Elmwood Park Slate Roof, Evanston Evergreen Slate, Evanston Mansard roof, Evanston natural slate, Evanston Slate Roof, Evergreen Park Evergreen Slate, Evergreen Park Mansard roof, Evergreen Park natural slate, Evergreen Park Slate Roof, Forest Park Evergreen Slate, Forest Park Mansard roof, Forest Park natural slate, Forest Park Slate Roof, Franklin Park Evergreen Slate, Franklin Park Mansard roof, Franklin Park natural slate, Franklin Park Slate Roof, Glenview Evergreen Slate, Glenview Mansard roof, Glenview natural slate, Glenview Slate Roof, Highland Park Evergreen Slate, Highland Park Mansard roof, Highland Park natural slate, Highland Park Slate Roof, Huntley Evergreen Slate, Huntley Mansard roof, Huntley natural slate, Huntley Slate Roof, Indian Head Park Evergreen Slate, Indian Head Park Mansard roof, Indian Head Park natural slate, Indian Head Park Slate Roof, Inverness Evergreen Slate, Inverness Mansard roof, Inverness natural slate, Inverness Slate Roof, Itasca Evergreen Slate, Itasca Mansard roof, Itasca natural slate, Itasca Slate Roof, La Grange Evergreen Slate, La Grange Mansard roof, La Grange natural slate, La Grange Slate Roof, Lake Barrington Shores Evergreen Slate, Lake Barrington Shores Mansard roof, Lake Barrington Shores natural slate, Lake Barrington Shores Slate Roof, Lake Forest Evergreen Slate, Lake Forest Mansard roof, Lake Forest natural slate, Lake Forest Slate Roof, Lake in the Hills Evergreen Slate, Lake in the Hills Mansard roof, Lake in the Hills natural slate, Lake in the Hills Slate Roof, Lake Villa Evergreen Slate, Lake Villa Mansard roof, Lake Villa natural slate, Lake Villa Slate Roof, Lake Zurich Evergreen Slate, Lake Zurich Mansard roof, Lake Zurich natural slate, Lake Zurich Slate Roof, Lemont Evergreen Slate, Lemont Mansard roof, Lemont natural slate, Lemont Slate Roof, Libertyville Evergreen Slate, Libertyville Mansard roof, Libertyville natural slate, Libertyville Slate Roof, Lincolnwood Evergreen Slate, Lincolnwood Mansard roof, Lincolnwood natural slate, Lincolnwood Slate Roof, Long Grove Evergreen Slate, Long Grove Mansard roof, Long Grove natural slate, Long Grove Slate Roof, Lyons Evergreen Slate, Lyons Mansard roof, Lyons natural slate, Lyons Slate Roof, Maine Township Evergreen Slate, Maine Township Mansard roof, Maine Township natural slate, Maine Township Slate Roof, Melrose Park Evergreen Slate, Melrose Park Mansard roof, Melrose Park natural slate, Melrose Park Slate Roof, Morton Grove Evergreen Slate, Morton Grove Mansard roof, Morton Grove natural slate, Morton Grove Slate Roof, Mount Prospect Evergreen Slate, Mount Prospect Mansard roof, Mount Prospect natural slate, Mount Prospect Slate Roof, Naperville Evergreen Slate, Naperville Mansard roof, Naperville natural slate, Naperville Slate Roof, Niles Evergreen Slate, Niles Mansard roof, Niles natural slate, Niles Slate Roof, North Lake Evergreen Slate, North Lake Mansard roof, North Lake natural slate, North Lake Slate Roof, North Shore Evergreen Slate, North Shore Mansard roof, North Shore natural slate, North Shore Slate Roof, Northbrook Evergreen Slate, Northbrook Mansard roof, Northbrook natural slate, Northbrook Slate Roof, Northfield Evergreen Slate, Northfield Mansard roof, Northfield natural slate, Northfield Slate Roof, Oak Brook Mansard roof, Oak Brook natural slate, Oak Brook Slate Roof, Oak Forest Evergreen Slate, Oak Forest Mansard roof, Oak Forest natural slate, Oak Forest Slate Roof, Oak Lawn Evergreen Slate, Oak Lawn Mansard roof, Oak Lawn natural slate, Oak Lawn Slate Roof, Oak Park Evergreen Slate, Oak Park Mansard roof, Oak Park natural slate, Oak Park Slate Roof, Palatine Evergreen Slate, Palatine Mansard roof, Palatine natural slate, Palatine Slate Roof, Palos Evergreen Slate, Palos Mansard roof, Palos natural slate, Palos Slate Roof, Park Forest Evergreen Slate, Park Forest Mansard roof, Park Forest natural slate, Park Forest Slate Roof, Park Ridge Evergreen Slate, Park Ridge Mansard roof, Park Ridge natural slate, Park Ridge Slate Roof, River Forest Evergreen Slate, River Forest Mansard roof, River Forest natural slate, River Forest Slate Roof, Riverside Evergreen Slate, Riverside Mansard roof, Riverside natural slate, Riverside Slate Roof, Rolling Meadows Evergreen Slate, Rolling Meadows Mansard roof, Rolling Meadows natural slate, Rolling Meadows Slate Roof, Roselle Evergreen Slate, Roselle Mansard roof, Roselle natural slate, Roselle Slate Roof, Rosemont Evergreen Slate, Rosemont Mansard roof, Rosemont natural slate, Rosemont Slate Roof, Schaumburg Evergreen Slate, Schaumburg Mansard roof, Schaumburg natural slate, Schaumburg Slate Roof, Schiller Park Evergreen Slate, Schiller Park Mansard roof, Schiller Park natural slate, Schiller Park Slate Roof, Skokie Evergreen Slate, Skokie Mansard roof, Skokie natural slate, Skokie Slate Roof, South Barrington Evergreen Slate, South Barrington Mansard roof, South Barrington natural slate, South Barrington Slate Roof, St. Charles Evergreen Slate, St. Charles Mansard roof, St. Charles natural slate, St. Charles Slate Roof, Streamwood Evergreen Slate, Streamwood Mansard roof, Streamwood natural slate, Streamwood Slate Roof, Sugar Grove Evergreen Slate, Sugar Grove Mansard roof, Sugar Grove natural slate, Sugar Grove Slate Roof, Tinley Park Evergreen Slate, Tinley Park Mansard roof, Tinley Park natural slate, Tinley Park Slate Roof, Vernon Hills Evergreen Slate, Vernon Hills Mansard roof, Vernon Hills natural slate, Vernon Hills Slate Roof, Westchester Evergreen Slate, Westchester Mansard roof, Westchester natural slate, Westchester Slate Roof, Western Springs Evergreen Slate, Western Springs Mansard roof, Western Springs natural slate, Western Springs Slate Roof, Wheeling Evergreen Slate, Wheeling Mansard roof, Wheeling natural slate, Wheeling Slate Roof, Willow Springs Evergreen Slate, Willow Springs Mansard roof, Willow Springs natural slate, Willow Springs Slate Roof, Wilmette Evergreen Slate, Wilmette Mansard roof, Wilmette natural slate, Wilmette Slate Roof, Winnetka Evergreen Slate, Winnetka Mansard roof, Winnetka natural slate, Winnetka Slate Roof, Wood Dale Evergreen Slate, Wood Dale Mansard roof, Wood Dale natural slate, Wood Dale Slate Roof, Woodridge Evergreen Slate, Woodridge Mansard roof, Woodridge natural slate, Woodridge Slate Roof. Bookmark the permalink.